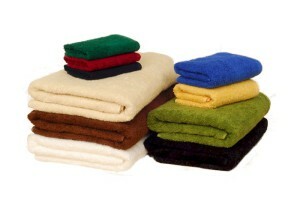 Millennium towels are found in finer department stores. These thick and thirsty towels are great for embroidery but too thick for screen printing. Millennium towels are subject to availability. Pricing is subject to change without notice. Hunter, Karat, Navy, and Royal. Towels Include Wash Cloths, Hand Towels, and Bath Towels. 13″ x 13″ Looped Terry 1.8 Lbs./Doz. Price: White and Natural: $1.50 ea. Colors: $1.90 ea. Case Price: White and Natural: $1.25 ea. Colors: $1.60 ea. 16″ x 28″ Looped Terry 4.5 Lbs./Doz. Price: White and Natural: $3.50 ea. Colors: $4.50 ea. Case Price: White and Natural: $3.30 ea. Colors: $4.30 ea. 27″ x 52″ Looped Terry 16 Lbs./Doz. Price: White and Natural: $9.70 ea. Colors: $11.40 ea. Case Price: White and Natural: $9.20 ea. Colors: $10.90 ea. Style # 36 – 71 Pcs. 72 – 287 Pcs. 288 – 599 Pcs. 600 – 1,199 Pcs.